Are you looking for a costume that's not overdone? Are you also looking for a character that's a sure crowd favorite? After all this time we're here to remind you of the hero of the golden cartoon era. A creature of uniquely rich history who simply wants to live his life in the forest while remaining a consistent smart-aleck. Yes, friends, we're talking about the master of escapes and escapades. The Houdini of hunting season. The wascally-wabbit that brought us "what's up Doc? ", Bugs Bunny. There's no one we'd rather chase through the woods than this capricious creature so it makes sense that Bugs is welcome at any Halloween party that might pop up in your vicinity! 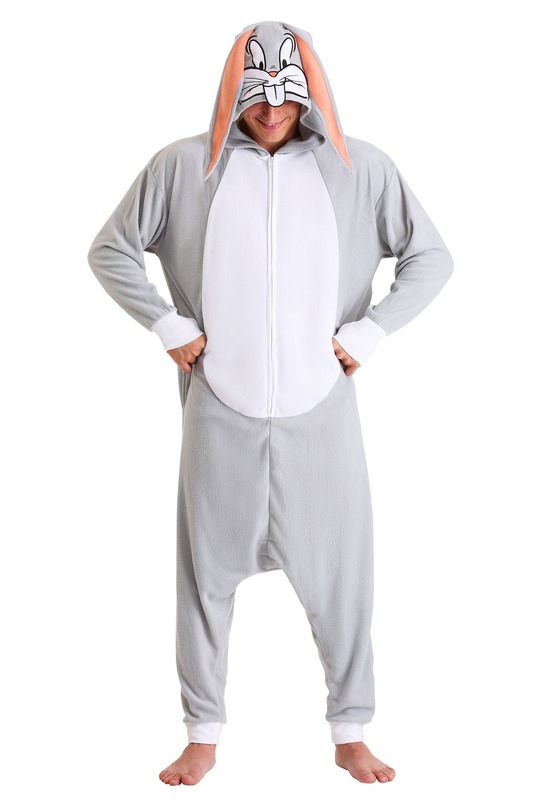 Are you down with the kigurumi lifestyle? If you're into over-sized super cozy clothing than you'll be on board if you aren't already. This fleecy suit zips up the front and has cuffs on the pants and sleeves to keep the warmth in. The look is big enough to fit another layer of clothing under, perfect for keeping you warm on chilly days. 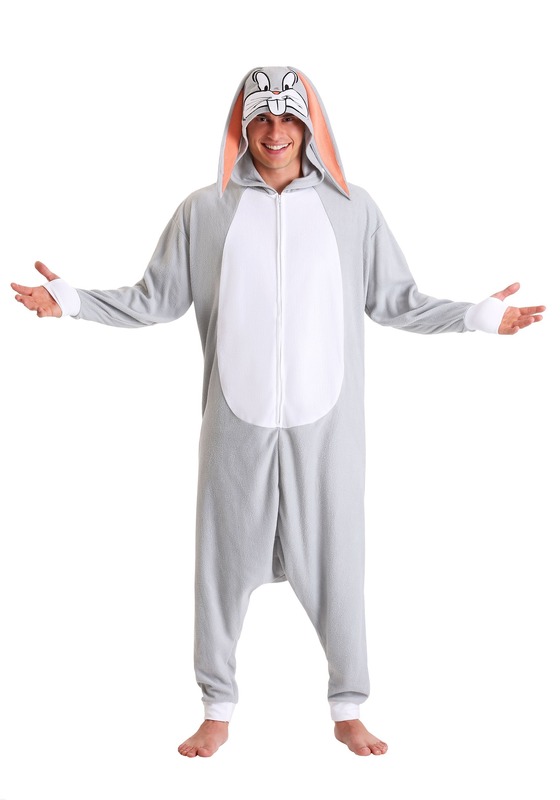 The hood has Bugs Bunny's saucy face attached to the top and long ears to give you an extra rabbity attitude. The back is accented with a cheerful white tail so people can see who you are from behind. Are you ready to stir up some trouble? It's okay to cause trouble when you're Bugs, Fudd started it, after all. These soft kigurumi suits are perfect for cold weather outdoor events, lounging around at home, as well as costume parties. You'll love how easy it is to move as well as how comfortable you feel. 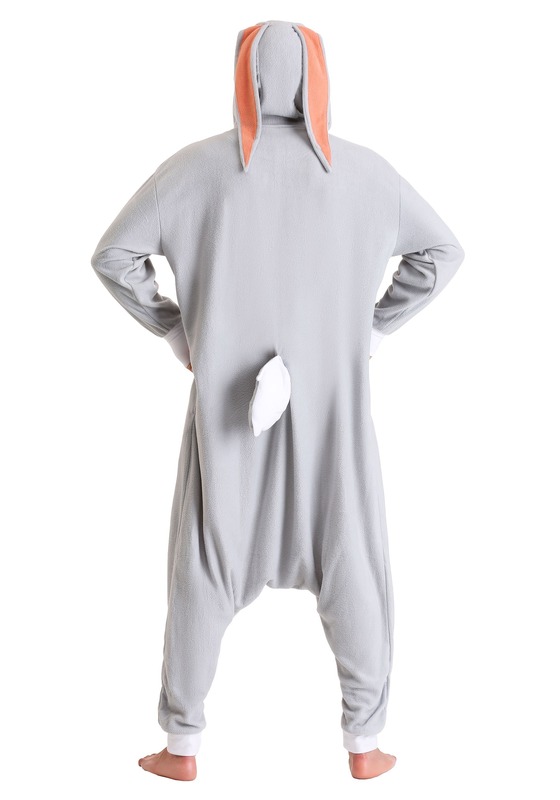 Pair this look with a "Wabbit" hunter costume and don't forget to bring plenty of carrots. After all, how else are you going to nonchalantly snack while taunting others while relaxing against a wall?